Order Online 24 hours a day, 7 days a week. Next Day Air shipping available on most orders. Without a working Faraday bag like the Dead Zone Bag the only other way to prevent a mobile phone from constantly transmitting location information is to remove the phone's batteries, which is not possible with most mobile phones made after 2006, without destructively disassembling and permanently damaging the phone. Read more about how your privacy is constantly compromised by mobile devices. Each of our standard size Dead Zone Bags is Guaranteed to work or your money back. No other competing manufacturer of signal blocking faraday type bags can offer this money back guarantee; because their Chinese produced, cheaply made bags just don't work. Dead Zone Bags were designed by a Military Trained Radio Operator with many years of independent Radiophysics and Electronics experience and experimentation projects. Due to the physical characteristics of the proprietary, 100% Stainless steel micro-fine mesh fabric, our Dead Zone Bags have an unusual metallic luster and sheen to them. Additionally, any creases or wrinkles made in this material will likely be very noticeable and very permanent. These creases and wrinkles do not affect the radio-physical properties of the bag as it relates to blocking radio signals. We have had requests from our customers, to manufacture our Dead Zone Bags with an attractive outer fabric shell; in order to make our product more attractive. This is not advisable: as the micro-fine mesh fabric needs to be visually inspected to ensure that it has no holes or rips in it that will allow radio signals to pass through. Dead Zone Bags were designed to reliably block radio signals, not to look pretty! Dead Zone Bags are capable of blocking other radio services; both significantly higher and lower in frequency than those listed above, however we will only Warranty our products for blocking the radio signals for the devices and services listed above. Sized to accommodate nearly all mobile phones and portable GPS units up to 8'' Length by 4'' width and 1'' thick. Durable Grippin Strip brand hook and loop closure, proprietary 100% Stainless Steel Mesh Fabric and industrial grade nylon thread. Proprietary alloy, durable 100% Stainless steel fabric means: Dead Zone Bags bags have the maximum radio signal blocking capability compared to bags produced from Fiber Textile blends that contain 85% or more polyester or cotton with a few strands of nickel plated copper woven into it. 100% Stainless steel is 100% metallic, so 100% of it's surface is conductive, not the 15% or so conductivity you may get with a fiber blended textile. a new one of their bags after just 6 months of use; because the cheaper, weaker copper based fabric they use gets metal fatigued from repeated flexing and bending and begins to break down in those 6 months. What that means: As the copper fibers begin to break from being bent back and forth repeatedly, they begin to allow Radio Signal Leakage, rendering our competitor's signal blocking bags useless. Think about bending a paper clip back and forth until it breaks, that is exactly what is happening on a microscopic scale in our competitors bags. Please note: many networks will detect if user's devices are not communicating with the network and will re-transmit text messages, e-mails, and other data when the phone is able to communicate again with the network. Therefore, your phone will download messages that were not received while it was stored in a Dead Zone Bag , usually within 5 to 10 minutes of opening the bag and allowing radio signals to enter and escape. It is not possible to use your mobile device while it is in a Dead Zone Bag, and your phone will not receive calls, text messages or other communications while it is inside a properly closed Dead Zone Bag, your mobile device will function as if it has been taken somewhere out of range of all wireless networks. 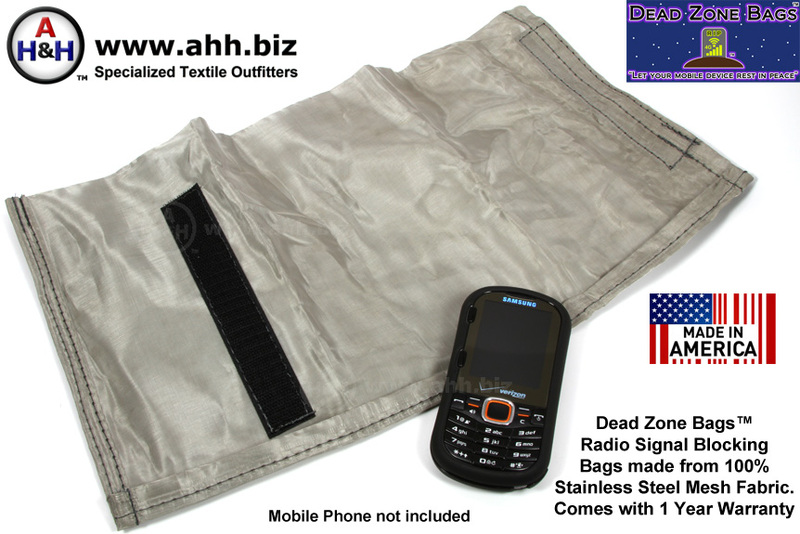 Dead Zone Bags are passive radio signal shielding devices, they are not radio signal jamming devices, they do not require a license, they will not cause interference to radio devices that are not placed inside them, they will NOT cause any damage your mobile device, and they are completely legal in all 50 states, and all countries that we know of. Putting your mobile device into Dead Zone Bag to block it's radio signal, is no different than taking your mobile device into a basement, a cave, or a heavily constructed building that is too dense to allow radio signals to penetrate it. Dead Zone Bags are also a great gift for anyone who must carry a mobile device but is worried about excessive exposure to Electromagnetic Radiation, particularly pregnant women. Yale School of medicine researchers have recently determined that Cell phone use in pregnancy may cause problems for unborn children. Dead Zone Bags can also be used for RF Signal Isolation for Forensics to assist law enforcement government agencies and researchers preserve and transport seized wireless devices for later exploitation and analysis. Dead Zone Bags Can assist in evidence seizure by preventing a seized wireless device from being tampered with remotely, possibly destroying all evidence value of the device. And many more phones and smartphones. Other sizes Dead Zone Bags are available, as well as custom sizes and shapes. Contact us for more information. 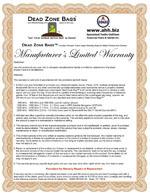 Dead Zone Bag is a trademark of American Home & Habitat Inc.